This big-screen adaptation of the famous TV series from the 1970s and '80s stars Dax Shepard and Michael Peña as a pair of California Highway Patrol officers. Ryan Hansen, Jessica McNamee, Kristen Bell, Vincent D'Onofrio, Maya Rudolph, and Adam Brody co-star. 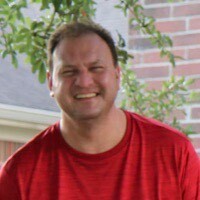 Shepard also wrote and directed. 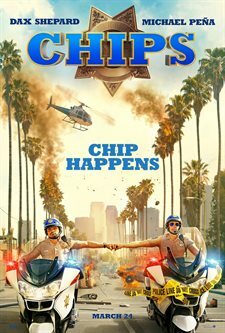 Download CHiPs in Digital HD from the iTunes store. CHiPs images are © Warner Bros.. All Rights Reserved. When I was a little girl, I loved cheesy television shows. The Love Boat, Fantasy Island, and CHiPs were among some of my favorites. Granted, they weren't great television by today's standards but when you are young you don't really worry about those things. It was fun television that entertained and there wasn't much more a person could ask for back then. With the way things are going, it was only a matter of time before someone decided to make these old shows into movies and CHiPs seems to be the latest in a revisualization of a 1970's classic. Starring Dax Shepard (Parenthood) and Michael Pena (The Martian) as Baker and Poncharello respectively, this version has the bare bones outline of the beloved show but this movie is definitely not the same. Raunchy jokes and lots of cursing, not to mention some amazing motorcycle stunts, make this year's CHiPs appealing to younger audiences who probably don't know the original. Unlike the televisions show, Frank "Ponch" Poncherello is an FBI agent going undercover to try and figure out who is holding up armored cars. Because of the nature of the heists and the people involved, there is speculation that the robbers are actually police officers and Ponch is sent to try an infiltrate their ranks. Jon Baker is a washed up extreme sports star whose life is in shambles. His wife, whom he still holds a candle for, is divorcing him and every time it rains his body gives out on him. He is a screw up in the academy and this assignment is his one and only chance to try and keep his job and impress his wife in hopes to win her back. Teamed together, these guys initially mix like oil and water but once they learn to appreciate each other's differences, they actually work well together to solve the case and arrest the bad guys. The duo of Shepard and Pena is one of the good things about this movie. They have an easiness together that makes their scenes work and the dialogue flow nicely. They were great casting choices (Shepard wrote and directed the film as well) bringing the essence of Ponch and Baker to the big screen while allowing the actors to make them their own. Vincent D'Onofrio (Men in Black) plays dirty cop Vic Brown and he is a joy to watch. I don't think I've ever seen him in a bad role and this is no exception. Shepard's wife, Kristen Bell (Bad Moms) plays his estranged wife and Maya Rudolph (Bridesmaids) adds some humor in a terrific and brief cameo. Rounding out the cast are Adam Brody (Mr. & Mrs. Smith), Jessica McNamee (Sirens) and Rosa Salazar (Maze Runner: The Scorch Trials). Shepard's script is good enough with some playful banter between the leads. It serves its purpose in moving the plot along but sometimes goes to places that garnered the movie its R rating. His directing is fine as well, with a few terrific shots of what is meant to be the California highway. The best part of the film has to be the motorcycles though. I'm not generally a fan of them but Shepard knows how to highlight them in such a way as to show off their speed and maneuverability that is impressive. If you happen to enjoy motorcycles, you will certainly appreciate this film. While this CHiPs is nothing like the television show it is a fun, good time. The stars, action and even the plot keep the audience interested and entertained. For those of us that remember watching the original television show, it definitely isn't the same but gives one a small sense of nostalgia, none the less.